The aim is to simplify processes for business, while not reducing consumer and environmental protection. A bill to combat the over-transposition of European standards into French law was adopted by the French Senate on 7 November. It attempts to juggle the sometimes conflicting concerns of competitiveness and public interest. The fight against over-transposition is a project sought by Emmanuel Macron, who was Minister of Economy and Finance under François Hollande. The fight is now being continued with the adoption of a text which removes a large number of over-transpositions in the fields of the economy, sustainable development, agriculture and culture. French MPs think that France often tends to overdo it when it comes to transposing European laws into its own legal framework. Over-transposition damages French businesses, which are therefore put in a difficult position compared to their European competitors. “Over-transposition is a hindrance to the competitiveness of French businesses. Any over-transposition has to be identified and justified on specific environmental and consumer protection grounds,” said René Danesi, president of the special committee responsible for examining the bill. The French enthusiasm for transposing ranges from extending fields of application, refusing to apply available exceptions and raising minimum thresholds. However, the European directives impose minimum standards on all of the member states. Over-transposition is therefore a tool which can be a political choice to support greater consumer and environmental protection, noted Agnès Pannier-Runacher, Minister of State, attached to the Minister of Economy and Finance during a committee debate on the bill. “There may be very good reason to over-transpose: having a more protective standard to better protect businesses and citizens,” she underlined. “Other member states have gone before us in the fight against over-transposition. The United Kingdom adopted transposition guidance in 2013. In Germany, the national regulatory control council [NKR] gives an opinion on the existence of risks, which are then taken into consideration by the federal ministries,” noted Nathalie Loiseau, Minister for European Affairs, attached to the Minister for Europe and Foreign Affairs. Accordingly, the bill targets 27 existing over-transpositions. But at the plenary debate, four over-transpositions identified by the bill were ultimately discarded. Two of the removed articles were intended to alleviate constraints imposed on advertising for consumer credit and housing finance. “While the fight against over-transpositions is an overriding objective that I fully support, it mustn’t be used as an excuse for lowering the level of protection for French consumers,” protested Michel Raison, a senator from Les Républicains. “The government’s text proposes nothing less than removing a whole section of French legislation in the field of consumer credit, which greatly protects consumers,” protested Alain Bazot, president of UFC – Que Choisir, a consumer organisation. 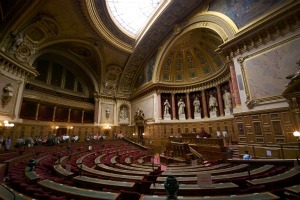 The issue of migratory birds, another controversy from the hunt on over-transposition, has also divided French senators. The French bill stipulates a ban exemption from hunting certain birds during their migration, a practice that is prohibited by several pieces of environmental laws. The article which allows certain exemptions, notably in order to avoid agricultural damage, was adopted despite strong opposition from the left in the French National Assembly.